*I'm still mulling over my list of possible resolutions, goals, flash-in-the-pan changes I want to make for 2011. And I'm only four days behind so far, so, YAY for that. *Actually though (hangs head) I haven't even started a list. *I suppose I'm only thinking about thinking about goals and changes at this point. * Don't even get me started about choosing a word for 2011. Oy vey! *But I'm thinking about choosing one. *We spent a lovely New Year's day at my dad and Peggy's house where there was much football viewing, black-eyed pea chomping, chatting and card playing. *Annelise got to play with Peggy's grandsons and had another one of those BEST DAYS EVER IN HER WHOLE ENTIRE LIFE climbing trees, shooting baskets, playing tag, riding bikes, playing hide-n-go-seek, eating lots of JUNK washed down with Grapette soda followed by foam light saber wars. *Thanks to a concerted effort Sunday afternoon all of our Christmas paraphernalia is packed away and things are back to *normal*. *Except I insisted on changing the furniture around in our family room, which has become an after Christmas tradition, and therefore we have a new normal. *And it's kind of weird. *I decided to put two chairs together to fill in an empty spot along one wall and from one angle it looks so-so and from the other it looks just this side of silly, because, really, who's going to go and sit against the wall instead of in front of the TV anyway? *But I think I'd rather have weird instead of empty. *And there is something called a subwoofer now residing on our family room floor and we have yet another remote to add to our collection all in the name of the home theater experience. *It was a little sad to see our tree sitting at the end of the driveway waiting to be picked up by the garbage men yesterday morning. *I feel sad about that every January. *But, no, we didn't recycle. Sorry Mother Earth. *I've started writing in my 10-year journal again. *Seriously, how hard is it to find (make? take?) time to jot down five lines every day? *Based on my numerous blank gaps throughout 2010, it's apparently quite hard. *But I always like reading back over the previous year's entries, so I promise to do much better this year. *I popped into our bathroom yesterday morning to tell Scott (while he was busy shaving) that we had taken down our Christmas decorations on the same weekend for the last three years and he looked at me like I had quite possibly lost my mind. *But I stand by my conviction that a 10 year journal is priceless. *In other news, Annelise is happy as a clam to be back at school. *Scott is happy as a clam to be back at work. *Well, that might be stretching it a bit. *I am happy as a clam to be back to our routine. 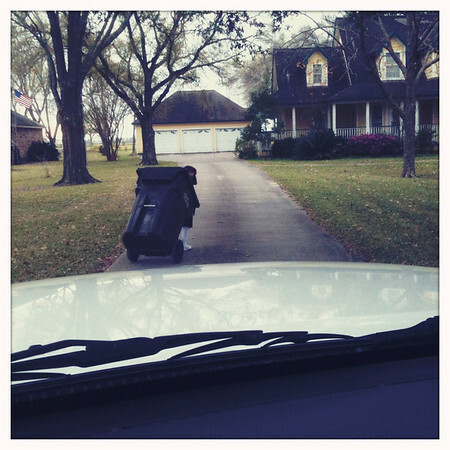 And on a slightly blasphemous side note: Yesterday Annelise hopped out of the car to get the mail and I asked her if she thought she could bring the trash can up to the house so Scott wouldn't have to do it (notice I didn't say me). After thinking about it for a split second she agreed and then proceeded to haul it down the driveway toward the house. But not before exclaiming, as she was trying to get situated with the ginormous can leaning against her back, "Mom! This is just like when Jesus had to carry the cross!!" with extra loud 7 year-old volume and sincere 7 year-old conviction. And I know it wasn't even remotely close, and certainly not something that should be made light of, but...I couldn't help but laugh. And of course take a picture. we're laughing too! she's got a good brain and maybe one day will be great with teaching analogies!